The appearance in the eighteenth century of the Kollyvades on the Holy Mountain, and in Greece in general, constitutes a dynamic return to the roots of Orthodox tradition, to the "philokalic" experience which is at the core of the Orthodox Church's spirituality. Their "movement", as it was called, was regenerative and traditional, progressive and yet patristic. In other words, genuinely Orthodox. Using the scholarly methods of the time (composing writings), they first of all revealed the continuity of hesychasm on the Holy Mountain Athos, and at the same time remained faithful not only to the theoretical formulation of the hesychastic-Palamite theology, but also to its practical applications, i.e. the whole spectrum of the ascetic experience. Through the dissemination of their works and by their struggles in defence of the tradition, they formed the counter balance against the European "Enlightenment," and in their own right became enlighteners of their Nation and of Orthodoxy at large. That is why they were loved by traditionalists, but hated and fought (or slandered) by those who were instilled with the spirit of Frankish scholasticism or of the Anglo-French Enlightenment and were thus cut off from the philokalic roots. The hypertrophic (metaphysical) rationalism of the westernizers, a standing threat to the patristic way of theology, thus proved to be foreign to the experiential and Holy-Spiritual way of theology which the Kollyvades Fathers embodied and preached. If our reconnection with the genuine, theological tradition of the Fathers has been achieved in our day, this is owed to the precursory labors of the Kollyvades. 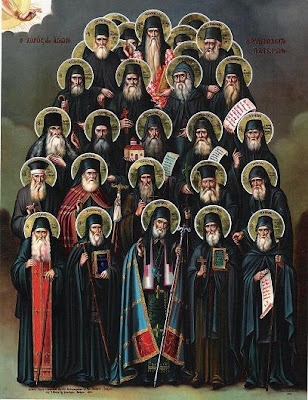 A contingent of Athonite monks in the second half of the eighteenth century, living within the tradition of "noetic prayer" or "prayer of the heart," and being provoked by a seemingly insignificant happening, which, however, had deep theological roots and enormous extensions, will light the Church's course and reveal the continuity or discontinuity of the fullness of Orthodoxy. The monks of Saint Anna's Skete on the Holy Mountain were building a larger church and, since they wanted to be able to work on Saturdays in order to complete it, they decided to move the memorial services from Saturday to Sunday after the Divine Liturgy. This decision, which conflicted with the Church's practice and theology (Sunday being the day of the Resurrection is a day of joy), scandalized the deacon Neophytos the Peloponnesian of the nearby Skete of Kavsokalyva, who was the first to rise up with a theological campaign against the decision of the monks of Saint Anna's. One further event also served to intensify the now ignited flame. In 1777, a book advocating the necessity of "frequent Holy Communion" was published from among the circle of Athonite hesychasts who, because of their involvement in the dispute "concerning memorial services" were by their opponents collectively called "Kollyvades" (from kollyva, the boiled wheat used at memorial services). The book was condemned by the Ecumenical Patriarchate in 1785, for it supposedly created scandals and dissensions. Aside from exposing the contra-traditional attitude of the monks of Saint Anna's, this action revealed how Orthodox criteria had become obscured, thus affirming, also for Greece, what the ever-memorable Fr. Georges Florovsky called a "pseudomorphosis." The Patriarchate's later decision, moreover, by which the condemnation was lifted, serves to show the instability of these matters. The men who advocated the canonical performance of memorial services on Saturday also advocated frequent Holy Communion (when, of course, the correct Orthodox presuppositions of an ongoing spiritual life exist), thus ranging the practice of the early Church against the unfounded actions of their opponents. The latter, being as they were completely estranged from the tradition of the Holy Fathers, accused the Kollyvades of being innovators, in exactly the same way that the fourteenth century Scholastics (Nikephoros Gregoras, John Kyparissiotes, etc.) had accused the hesychasts of the Holy Mountain of being "modernists." But then, the case of the Kollyvades is only a repetition of the affair of the hesychasts of the fourteenth century; for both groups, each in its own way, stood up against the spirit of the estranged West and against the westernizing of the "unionists" and westernizers of the East. The Kollyvades emphasized the issue of worship, for they diagnosed that there, i.e. in the area of the spirituality that preserved the unity of the subjugated Orthodox people, the problem of estrangement was perceptible. They encouraged participation in the sacraments/mysteries of the Church accompanied by a parallel spiritual struggle. They strove for the correct observance of the Church's typicon that would maintain the spiritual balance, and for the study of patristic works that would cultivate a patristic phronema, i.e. the Church's mind. That is why the honor belongs to the Kollyvades, in that they preserved the Apostolic-Patristic continuity in the Church: noetic prayer and hesychastic practice, asceticism and experience, those enduring and unalterable elements of the Orthodox identity. 1) Neophytos Kavsokalyvitis (1713-1784), from 1749 rector of Athonias School on the Holy Mountain, is the man who initiated the cause; but after his expulsion from the Holy Mountain, he discontinued his active participation in the Kollyvades "movement" for reasons unknown. He dealt mainly with education, serving as rector in Chios around 1760; in Adrianople in 1763; and in what is today Romania, Bucharest 1767, Bravsko 1770, and from 1773 until his death again in Bucharest. He left behind a number of important works, among which are some on canon law. 2) Makarios Notaras (1731-1805), a descendant of the renowned Byzantine family of Notaras, was born in Corinth and later became Metropolitan of the diocese of Corinth (1765-1769). He was the "animator" of the movement and the person who not only encouraged St. Nikodemos to write, but also supplied him with material for his works. He died on 16 April 1805 on the island of Chios where he was living at the time, and the people immediately honored him as a Saint. 3) Nikodemos the Hagiorite (1749-1809), officially declared a Saint in 1955, was the "theologian" of the Kollyvades contingent. A great hesychast-ascetic and a highly accomplished author of patristic caliber, he left behind a multitude of writings in which the whole patristic tradition is recast. One who studies the works of St. Nikodemos can unreservedly say that he has gone through patristic theology in its entirety. His Handbook of Counsels, is for modern times, the representative work on Orthodox spirituality. The publication of the multi-volume Philokalia of the Wakeful Fathers (in collaboration with St. Makarios, but essentially the work of Nikodemos) contributed to spiritual rebirth in Orthodox countries. His work The Rudder constitutes the most authoritative compilation of our Church's holy Canons and explanations of them in conjunction with the Church's spirituality. 4) Athanasios Parios (1722-1813) was the most militant of the Kollyvades, and also the most martyric. From 1776 to 1781 he remained unfrocked as a "heretic" because of his vigorous stand on the issues of tradition. He passionately fought the European Enlightenment, Voltaireanism, and atheism, and was accused of being an obscurantist by his "West-struck" contemporaries. He, however, was not fighting education which he himself served, nor even the exact sciences themselves; but rather the "godless letters" and the conceit of the wisdom of this world (cf. James. 3:15). A prolific author, he left behind numerous writings full of patristic wisdom and spirituality. The Kollyvades exerted a tremendous influence in their day, but also on the generations that followed. Their influence initially was greater off the Holy Mountain than on it. Today, however, the Holy Mountain acknowledges their contribution to the rebirth of Orthodox spirituality and follows their tradition. In spite of the fact that the Anti-Kollyvades by far outnumbered the Kollyvades and engaged in a systematic persecution of them, not only did they fail to frustrate the latter's effort, but they in fact contributed to the spreading of their spirit in Greece and in the other Orthodox countries (Trans-Danubian regions, Russia, etc.). To the Kollyvades is owed the rebirth of hesychasm in the nineteenth century. Even today, the Kollyvades Fathers continue to be spiritual guides for the Orthodox, and the principal bridge of reconnection with the patristic tradition. The rediscovery of the hesychasm of the fourteenth century, and chiefly of its champion St. Gregory Palamas (d. 1357), was accomplished thanks to the seeds that the Kollyvades of the eighteenth century sowed.